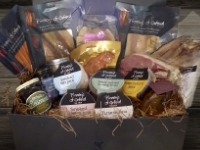 From the very beginning, The Shop has endeavoured to “champion” local producers and their products. Along with our main grocery suppliers, we continue to work closely with a number of established local producers who we believe offer quality products that are not usually available in the supermarkets. 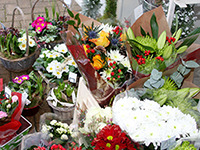 The Shop offers an attractive selection of plants and cut flowers, all supplied and managed by Amanda Milsom. Through the Shop, Amanda is pleased to accept special flower orders for any occasion. Wensleydale, Somerset Brie, Harlech with horseradish, Smoked Northumberland, Cote Hill Blue (Stilton), Godminster cheddar, Ticklemore goat’s cheese, Cornish Yarg (Ewes Pecorino), Cornish Yarg, Parmigiano Reggiano, and many more. 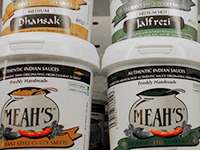 Meah's Curry Sauces are the result of over 35 years of restaurant experience where we built up a reputation for producing delicately flavoured authentic Indian dishes and friendly service. 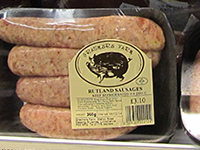 Operating from their own Free Range Pork farms in Market Deeping, Grasmere supply a range of high quality sausages, bacon, gammon, ham, hot & cold eating pies and barbecue items. They are one of the main supplier to The Shop. This quality local bakery has served The Shop with fresh bread since we opened. We have deliveries of fresh product 6 days every week. Acil utat vullaorper iliquamet inim dolestrud magna ad delent praestie con ut ing enisl illam quis nullandipsum vel irit ulpute dunt wismodignit wis num exeraes sequipisissi tinisl dit prasustod. Spalding based supplier of quality Free Range Eggs. The shop also arranges weekly deliveries of fresh fish from Pinney’s Suffolk Smokery, including salmon steaks, kippers and smoked haddock fillets. Longley Farm has been producing prize winning yogurt for over 40 years. The range includes natural and bio, fruit and plain yogurts.